One of the UK’s leading workholding specialists will unveil a new brand this week as part of a three-year plan to hit £10m in annual sales. Hyfore, which employs 36 people at its facility in Coventry, will use its appearance at Southern Manufacturing & Electronics (21st to 23rd March) to showcase its new corporate identity, an extensive marketing campaign and the launch of a new online shop to supply up to 100,000 products. The exciting plans will involve the initial recruitment of three people and will ensure the company builds on a successful 12 months that has seen it grow by 15% and become a critical partner to manufacturers looking for bespoke jigs, fixtures, gauges and workholding systems for use on CNC machining centres. 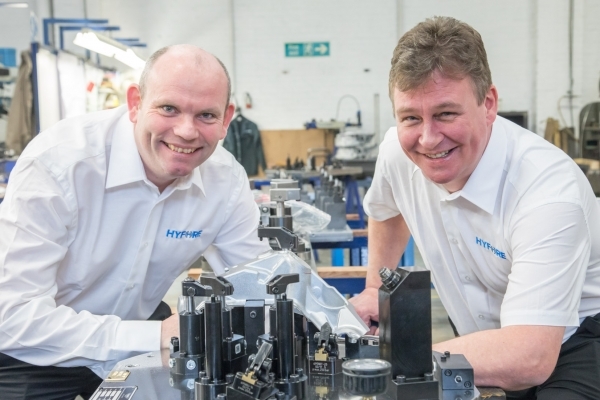 “Our reputation has been built on our ability to work with customers on designing, and manufacturing workholding that allows them to get the most out of their machines and this includes clients producing precision parts for the automotive sector and commercial vehicles,” explained Gary Dickenson, who runs Hyfore with Darren Underhill. www.hyfore.shop is being headed up by Rob Beckett, who is in charge of developing the e-commerce website ahead of its official launch at Southern Manufacturing & Electronics (Stand T122). The industry expert has spent the last six months amassing more than 40,000 different products that can be used with CNC machining centres sold across the world. These range from off-the-shelf vices, collets, gauges and chucks to specialist parts, including pallet changers and 4th and 5th axis tables. “This is just the start…we aim to be at about 100,000 products by the end of the year, making it arguably the best stocked virtual shop in the world,” pointed out Rob.